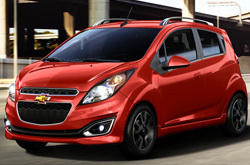 We have great 2013 Chevrolet Spark research and reviews below so you can start learning about the new Spark. We are a chief Chevrolet dealership in Phoenix, and it's our mission to equip you with Chevrolet reviews written by some of the most outstanding automotive writers in the industry. 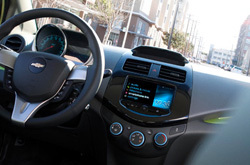 All of the things you need to know about the Chevrolet Spark are right here in this article. Each passage is overloaded with practical info and Spark details. Is the 2013 Spark right for your family? Continue reading and find out! Comparing the 2013 Chevrolet Spark against against vehicles like the 2013 Smart ForTwo, Fiat 500 and the Scion iQ, and you will spot that the 2013 Spark ranks above the competition in loads areas. Browse our bullets to see why! Like the Spark? Get a quote on your trade-in and save! Unlike conglomerate auto centers, our Phoenix car repair facility offers bona fide OEM parts, spectacular Chevrolet trained technicians and a free warranty for all work. We're also conveniently positioned near many well-known neighboring cities. The experts at our AZ Chevrolet service center can be trusted to keep your Spark in excellent physical shape for years to come. For conventional oil changes and other Chevrolet services like tire rotation and replacement and windshield wiper replacement, come to us. We even work on arduous endeavors with no trouble, including jobs like transmission repair. From the straightforward to the complex, Midway Chevrolet does it all and offers reasonable prices, superior service and experts mechanics. Click the upcoming link to find incredible service specials now!